Now we get to how the pundits gleefully initiated the self-fulfilling prophecy of Surface’s autodestruct sequence. To see my angle, check out my blurb about a now-defunct subnotebook forum. Then the sociology behind these reviews is that, because the technology objects being reviewed are seen as “technical,” people often assume these reviews are objective and thus trustworthy as fact. This, too, is false. This is why I never bothered to study reviews for any of the devices I own; I will skim benchmarks like battery life (only useful if you know the testing conditions), and look for reliability reviews for hardware components. For full devices, however, I just don’t bother with these official reviews unless they are written based on use cases. Buying a laptop or tablet these days is like buying a car. There are tons on the market, all with different strengths and styling. Yet most of the reviews for the first generation and even a number of second generation Surface reviews look like this: A reviewer who favors Subaru sport wagons and SUVs doesn’t like the Honda Fit. A motorcycle enthusiast likewise thinks a subcompact is lame. Someone asks, why would you buy a small Volkswagen GTI when you can buy a Ford Fusion hybrid for the same price? However, if you lived in a big city with little precipitation, expensive gas, and never go off-roading, an SUV is obviously a poor choice. Or if you only ever intended on commuting to work solo, through downtown, an SUV is still a poor choice. If you like motorcycles but need something that can actually haul groceries for a family, a motorcycle is obviously a poor choice. Maybe you simply prefer the maneuverability and gas mileage of smaller cars over larger cars for the same price. These are “use cases”: For what purpose do you intend on using a device? Ultimately, a test drive is best, but that’s tough for a portable computing device. The underlying problem the Surface ran into is that no other device like it existed on the market (it was the first Windows RT device to market and is the last remaining, for now). Windows RT is capable, but it sits between the walled-garden nature of iOS/Android and the more powerful regular Windows OSes, so comparing to only the former is a disservice to RT while comparing only to the latter is patently unfair. Yet so many reviewers who couldn’t grasp that Windows RT and Surface were entering a product space previously unoccupied by anything else made that mistake–comparing to only iOS/Android or Windows 8. The use case approach was rarely ever addressed. And if the pundits already say that the Surface RT is not so great, wouldn’t average not-terribly-savvy buyers who can’t separate wheat from chaff take their advice? That was the self-fulfilling prophecy. Interestingly, actual user reviews differed from the pundit reviews by a noticeable margin. I did not include any reviews without numerical ratings, including all video reviews, and there are many without number ratings. TechCrunch, for example, didn’t like the Surface RT. I didn’t capture every pundit review with a rating either, simply because my multitasky searches were becoming saturated and a bit unwieldy (certain ones that are missing like Wired’s 4/5 only became obvious after the fact). Engadget actually has some kind of multiple review aggregation, but I don’t understand how they applied their own scaling system: 7.4 aggregate pundit reviews versus 8.9 user reviews. That’s a significant difference right there as well. I interpret the deviation in relation to poor sales like this: It means that if the real target consumers, like myself, were able to get their hands on a Surface despite Microsoft’s piss-poor marketing and pundit bias clouding up everything, the device is actually quite innovative and excellent for certain use cases. We like it. But adding together all the negative variables that messed with public perception, there were too many hurdles to get the Surface into the right hands. Add to that Microsoft’s naive gamble in manufacturing too many units, and thus we got the $900 mil write-down. 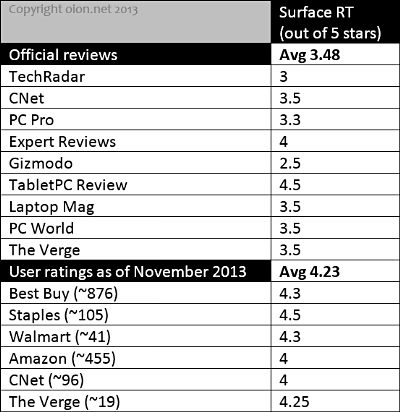 The second generation Surface products are seeing better pundit reviews, but a number still make the same mistakes that plagued the first generation reviews, such as complaining about Windows RT limitations. NEXT – Why Windows RT? PREVIOUS – What happened to the first generation of Surface?